Dental veneers are thin, tooth colored shells, bonded on the visible side of a tooth, to correct imperfections. 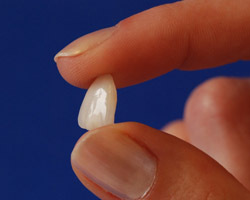 The material is made of porcelain, so the veneers appear very much like real teeth when bonded. Porcelain veneers are translucent, reflecting light in the same manner as natural teeth. A veneer-bonded tooth is, therefore, hard to distinguish from your natural teeth. For quality and natural-looking dental veneers in Maryville, TN, Dr. Kim C. Norman is your trusted and reliable dental care specialist. Since veneers cover the visible side of a tooth, many issues about the teeth can be solved with one dental treatment. Discoloration issues that teeth whitening cannot solve can be handled by natural-looking porcelain veneers. Teeth with cracks, chips, and worn enamel can likewise be masked to improve their appearance. If, on the other hand, you need to align your teeth instantly, veneers can serve as a wonderful orthodontic treatment, so you don’t need to wear braces on your teeth. Dental veneers serve to cover, mask, enhance, and beautify the teeth, giving you a beautiful, attractive smile. • First, you need to set an appointment for an initial consultation with Dr. Norman. You and the doctor will discuss your dental needs and goals, and see if veneers are right for you. • Once you and the doctor have agreed that veneers are part of your treatment plan, you will be scheduled for a second visit for tooth preparation. • Your tooth is prepared by removing its enamel by a few millimeters. Doing this will give space for the veneers, so your smile looks natural and your mouth functions naturally. • The dentist will then take an impression of your teeth. This model will be used to create your custom-fitted veneers. Dr. Norman will discuss with you the shade of veneers that complement your smile best. • Your third visit involves the permanent placement of your veneers. The doctor will apply a bonding resin on the visible side of the tooth, so the veneers will adhere well and stay secure for years. Dr. Norman will see to it that the veneers are comfortable for the mouth, adjusting everything to make sure that you bite, smile, speak, and eat naturally. Absolutely not! We will do everything to make sure that you are comfortable during the entire treatment process. Dr. Norman and our staff are well-trained and experienced to provide you with quality and painless dental veneers. Dental veneers are excellent dental solutions to mask teeth imperfections like cracked, chipped, misaligned, uneven, or discolored teeth. Find out more about dental veneers by calling us today at (865) 982-9662. A red carpet, movie star smile, is within your reach with dental veneers in Maryville, TN!